that kisses can be dangerous. hungry to return to their fields. Melissa Tuckey is the author of Rope as Witness, a chapbook published by Puddinghouse Press. She's received a Fine Arts Work Center residency, among other awards for her writing. Her poetry has been anthologized in DC Poets Against the War, Fire and Ink: An Anthology of Social Action Writing, Poets for Palestine, Days I Moved Through Ordinary Sounds: The Teachers of Writers Corps in Poetry and Prose, and is forthcoming in Ecopoetry: A Contemporary American Anthology. She is co-translator with Chun Ye and Fiona Sze-Lorrain of Chinese poet Yang Zi's collected works, which have been published by Conjunctions, Manoa, and Witness, among other journals. Tuckey serves as Poetry Editor at the online journal Foreign Policy in Focus (a think tank without walls). She teaches at Ithaca College, and lives in Ithaca, New York. Tuckey has been with Split This Rock since its inception and served as a founding co-director. She now serves on the Board of Directors. 1. Warrior Writers’ third anthology!!! We need your help to make it a reality! Time is running out to submit your work for Warrior Writers’ third anthology of writing and visual art. Download the complete submission guidelines here. Click here for the submission form you send in with your works. We have extended the deadline to August 10! Remember, you can post your work on the blog or Facebook to get feedback from others, but you must get feedback before you submit your final work with the form. A warrior’s work is a collection of thoughts, pain, happiness, fear, excitement, dread, beauty and ugliness. Our warriors band together to help others understand their past and see a future for themselves. They stand together in the Warrior Writers’ anthology like they stood together once on the battlefield. Will you stand with them as they move beyond war? Will you support them in getting their voices heard and their words read? Will you take a moment to give, to give their art a chance to be seen, heard, felt and understood? Veterans have struggled for decades with the silence of their stories. Please help fund the voices of this generations’ veterans. Donate here to help us get this book published! To buy one or both of our previous books, click here. For full submission guidelines, click here. Warrior Writers will perform at the First Annual New York Poetry Festival on Saturday, July 30th at Governor’s Island. The performance will showcase Veteran and ally artists. By performing together, Warrior Writers will show the power of art, not just through individual expression, but also through a collective process of veterans and allies supporting each other in healing and creativity. Click here for details. Hey Mid-Westerners, Warrior Writers has just confirmed dates for our Veterans and Community Conference in Chicago! The conference will be held from September 9-11. Some workshops include: writing, visual art, Working with Veterans 101, Facilitator’s Training and local support for Veterans. This conference will have a special emphasis on visual art, so we invite you painters, photographers, printers, and the like to come imagine with us! Limited travel scholarships are available for Veterans who are visual artists. They will be given on a first come, first served basis, apply online. Online registration opens on Wednesday August 3rd. Click here for registration info. Writing Exercise - There is no formal exercise this month. We need you to focus on typing, editing and sending in your work to be submitted for our anthology, deadline is AUGUST 1!!! * Be in the loop! We’re still building our database and need your addresses so we can send you postcards about upcoming events. Please click here to submit your info via our website. *Become our friends/supporters/fan on Facebook (Warrior Writers) and invite your friends to spread the word to their networks. This fall it will be 10 years since the murderous attacks of September 11, 2001. We'll have a chance to remember that awful day and to mourn the loss of so many lives. And then, we can take stock of our country's response and ask ourselves: Did we respond to the attacks in the most productive way? Did our response set us on the road to a healthier, safer, more just planet? ect of our response seems deeply, disastrously wrong-headed. Now, more than ever, we need the poets and other artists to imagine alternatives, to give voice to our deepest hopes and wildest dreams. We need you. new future. We'll choose our favorite poems for Poem of the Week and post some to 10 Years + Counting (see below), inviting peace and social justice groups nationwide to read the poems at their events and to use them in their organizing. This call is open to all, whether or not you have attended a Split This Rock festival or have been previously featured. Please see details below. 100,000 Poets for Change calls poets to speak out together for change on September 24. Over 400 events are planned around the world. If you're in the DC area, stay tuned for details about a Poetry Walk of Shame, readings outside the embassies of three countries whose citizens can't participate in the day's activities, for fear of detention and more. 10 Years + Counting invites artists and peace and social justice groups nationwide to use the power of creativity to illustrate the costs of war and image a more peaceful world. Split This Rock is providing poems for this effort - check out their blog for those we've posted so far. Use them yourself or send us your own to consider. See our Open Call below! 9/11 Arts Project: Healing 10 Yea rs Later - Here in DC, Split This Rock is joining the Smith Farm Center for the Healing Arts and many other groups in a city-wide "Year of Healing," with events to take place all over the city and throughout the year. On September 11 itself, we'll be presenting a special program of poetry, music, and visual art with Studio Gallery. Stay tuned for details! ear. Details of each of these initiatives, with links to their websites, are below. We look forward to a fall overflowing with creative democracy. Don't You Hear This Hammer Ring? This fall marks the 10th anniversary of the horrific attacks of September 11 and of our country's militarized and repressive response. Split This Rock calls for poems to help us mark this somber occasion, poems that mourn, rage, imagine, speak out for a new future. We'll choose our favorite poems for Poem of the Week and post some to 10 Years + Counting, inviting peace and social justice groups nationwide to read the poems at their events and to use them in their organizing. This call is open to all, whether or not you have attended a Split This Rock festival or have been previously featured. Split This Rock began Poem of the Week in 2009 as a way of publicizing the poets to be featured in the 2010 festival. We later opened it to registered participants at Split This Rock festivals. 90 poems later (and counting), the series reaches an expansive audience of poets, activists, and dreamers. Please send up to three short poems (poems of 40 lines or under work best) as a single Word document email attachment to: info@splitthisrock.org. Include in the cover email your full contact information (name, address, phone, email address) and a bio of up to 75 words. Poems may have been previously published in a book, chapbook, or print journal, but not on the web, please. If previously published, you must own the rights to the work. Please include the citation, including the web address of the publisher, so we may link to it. Poems will be featured on a rolling basis. We will contact you if your poem is accepted to confirm details, and may request additional information at that time. Poets around the world are organizing for what Stanford University is calling a historic event -- the largest poetry reading in history. On September 24, all poets are invited to join together for an all-inclusive event, which asks poets to take a stand for whatever social or political cause they feel compelled to support. At this time, 70 countries participating and about 400 individual events planned! A poetry and peace gathering in strife-torn Jalalabad, Afghanistan and poets in Nogales, Mexico and Nogales, Arizona reading poems to each other across the border fence are just two of the hundreds of events that will take place around the world. 100 Thousand Poets for Change is an open-ended event, and encourages participants to get creative. What will YOU bring to the table? To organize in your town, or to find an event nearby, please visit www.100TPC.org. And don't forget to RSVP on the Facebook Page. September 11 - October 7, 2011 will mark the ten year anniversary of our nation continuously at war. 10 Years + Counting invites artists and others to take this historic moment as inspiration and use the power of creativity to illustrate the costs of war and image a more peaceful world. Paint it, dance it, sculpt it, write it, sing it. Imagine peace and create connections. Concerts, readings, public art projects, garden parties, bake-offs, gallery exhibitions, street art, flash mobs, walks and runs: the possibilities are endless. Turn the weeks of this anniversary of devastation into an unstoppable, irrepressible explosion of imagining the possible, a new beginning. To organize in your town, or to find an event nearby, please visit: www.10yearsandcounting.com. Check out the 10 Years + Counting Blog to keep up to date on projects and read poems from Split This Rock poets. On the occasion of the 10th anniversary of 9/11, Smith Farm Center for the Healing Arts is spearheading this citywide arts initiative and catalyzing a "year of healing," with multi-venue project events to take place around the anniversary and throughout the year. Events and programs will span creative genres including dance and literary performances, visual arts exhibitions, facilitated dialogues, concerts, theater, interfaith services, and film screenings and will focus on such themes as social justice, multiculturalism, religious tolerance, art activism, individual healing, national trauma, and community engagement, to name a few. And, for individual artists looking to get involved, submit to the Art Bank! Follow the project on Twitter and use hashtag #911art to join the conversation! Kayla and Kosi performing in our first bout in San Fran, with NYC’s Urban Word Team watching in front. Photo by Jonathan B. Tucker, Coach. Now in its 14th year, the Brave New Voices International Youth Poetry Slam Festival (BNV) brings together young artists, outspoken activists, educators, poets, and emerging leaders to participate in a celebration and demonstration of free speech, artistic empowerment, and youth voice. 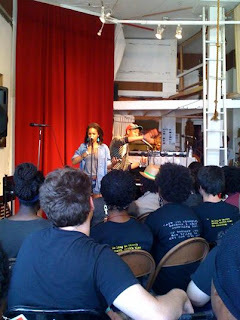 Washington, DC has sent a team of young poets (ages 13 – 19) to this poetry slam competition/festival every year for the past decade (and even hosted it here in the city in 2008), and this year, with the help of community co-sponsors like BloomBars, we were able to send a team of six teenagers to experience this unique world of poetry, activism, and community in the San Francisco Bay Area July 20-24. Over 50 teams of teen poets from all around the world came together to network and share their poetry over the course of the four-day festival last week. In addition to co-hosting The Garden open mic at BloomBars, I am privileged to be one of the coaches of the DC Youth Slam Team, so I was there in the dorms at UC Berkeley with our young DC poets and guiding them through the BART train system to our bouts in Oakland and San Fran. Although we did not win the competition, the points are not the point, the poetry is the point. In this regard, our team did a fantastic job! Not only did they get to meet and make friends with young poets like themselves from different states and countries, but as you can see below, they also got to meet with legendary activist and co-founder of the Black Panther Party for Self-Defense, Bobby Seale! To us, performance art, be it poetry or music or theatre, is not just about entertainment. We are community change agents and young leaders of the future using our skills to move the crowd. Whether that movement is for peace and justice, dialogue and understanding, or sustainable living and empowerment, our words and our poems serve as vehicles for something greater than rhymes and metaphors. Quite literally, we are trying to change lives with poetry. Our 2011 DC Youth Slam Team (Alexis, Kayla, Kosi, Lauryn, Rachel, and Selina) performed at BloomBars prior to leaving for San Francisco, and will continue to practice and perform here and around the DC area, including at the Save Our Schools March on the Capitol Saturday, July 30, 2011. We are very proud of our young poets and will continue to offer programming focused on developing their passion, poetry, voice, and performance for positive growth.